Fake wood storage cabinet hides 65-inch weatherproof Seura TV and rugged outdoor lift, without marring the olde farmhouse feel. 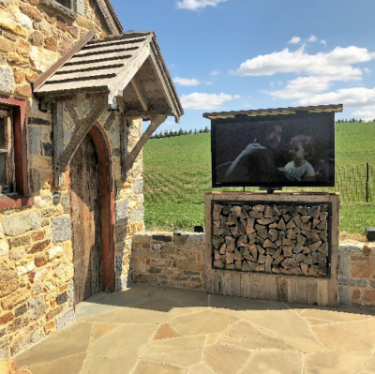 A homeowner wanted an outdoor living area straight out of the olden days, with ye olde pool house … and a 65-inch TV. “The ‘pool house’ was to look like it is hundreds of years old sitting next to a pond -- not a swimming pool,” says integrator Harry Blanchard of Creative Systems USA, based in Collegeville, Penn. In the original pool-house design, the architect called for a TV to be installed in a faux window, Blanchard explains, because the client wanted to see the TV from the patio and the pool. So Blanchard suggest instead that a TV be installed in a stone wall to be constructed around the back patio. The solution was acceptable except for one thing: The wall was only two feet tall. Architect happy. Builder happy because the design didn’t require a pocket below grade. Homeowner happy. I asked Blanchard what the biggest challenge was on this job. Creative Systems tied the TV and lift into a Crestron home-automation system already installed by the company. All of the A/V sources and head-end gear are housed in the home located about 150 feet away. The relay modules are located in the pool house. Crestron lightning-strike protectors are employed to protect the main house processor from lightning strikes at the pool house. Surge protection is provided by Furman. Topping it off is a landscape sound system from James Loudspeaker. Share your #SoCustom installs on social media.